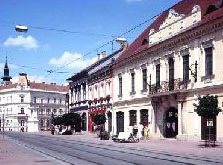 Miskolc, the third largest town in the country, is known for its industrial traditions as well as its rich history and culture. Its monuments are of outstanding interest: the Greek Orthodox Church is decorated with the largest iconostasis in Central Europe. The Avas Hill is known for its wine cellars. The Avas lookout tower offers a panorama of the city. There are 18th century Baroque buildings such as the Minorite Church and Monastery, the Lutheran Church and the Church of Mindszenty. The 17th century House of R�k�czi houses the Gallery of Miskolc. This institution presents the life-work of famous Hungarian graphic artists born in the city. The gallery of the Ott� Herman Museum and the mineral collection are also worth a visit. The medieval, four-tower Di�sgy.r Castle was the dowry of Hungarian queens. 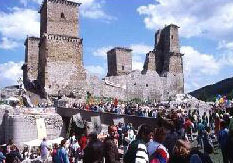 The exhibition in the round tower and the annual historical castle show in August recall those times. In neighbouring �jmassa, the Massa Museum presents the history of Di�sgy.r iron production. The Garadna trout farm, the ruins of the Pauline Monastery in Szentl�lek, the B�nk�t ski centre and the lookout places of the B�kk Mountains are worthwhile possible excursions. Miskolctapolca`s thermal cave bath is a natural formation. The water, rich in minerals, and the crystalline air of the cave have a healing effect on heart and vascular, rheumatic and respiratory disorders. Bathing here is an awesome experience, thanks to the special light effects, the underground stream and the bubble bath. Boating is relaxing on the scenic lake encircled by wild trees.